I know two blog posts in one day...cupcakes must be flying through the air! But alast no.. I have just finally been able to get my thought together this week (and I baked up all of my orders yesterday) so now I have some time to blog and since my posts have backed up I thought I would you guys 2 in one day as a way to catch up. Now I am not a fan of carrot cake..GASP! I know.. but those who know me know I don't really eat much cake these days. After baking and decorating for 3 years now cake doesn't look the same to me any more... I love it don't get me wrong but I just can't eat it unless I am trying out a new recipe. What prompted me to search for a really good from scratch carrot cake recipe is my mother in law. She loves carrot cake so a while back I was on the hunt for a really great recipe that she would enjoy being that its always a nice thing to impress the mother in law (beside she cooks wayyyyy better than I do, so cooking for her was out lol). Now this recipe I am going to give out will be one a very few recipes.. as you know.. us bakers they are our trade secrets. So to stay in business we keep them close to the vest, but I don't mind giving one out every now and then to my readers:) This recipe is also great for someone who is on a diary free diet because there is no diary in this recipe at all! Eggs aren't really considered diary so because they aren't made with milk (or the casein protein which alot of people are allergic too). The recipe calls for grated carrots, I cheated and use my food processor which I would recommend for those of you who have one. This recipe makes a great moist carrot cake from scratch (cause I'm all about the scratch baby). Preheat oven to 350 degrees. Spray two 8 inch round cake pans (or butter and flour) and line the bottoms of the pans with a circle of parchment paper. In a separate bowl whisk together the flour, baking soda, baking powder, salt, cinnamon, nutmeg and ginger. In bowl of electric mixer (or with a hand mixer), beat the eggs until well combined. Gradually add the sugar and beat until the batter is thick and light colored. Add the oil in a steady stream and then beat in the vanilla extract. With a large rubber spatula fold in the grated carrots and chopped nuts. Evenly divide the batter between the two prepared pans and bake 25 to 30 minutes or until a toothpick inserted in the center comes out clean. After about 5 minutes flip pans over onto a wire rack or pan flat pan (like a cookie sheet) if you don't have one to finish cooling. Level the tops, fill, frost and enjoy! 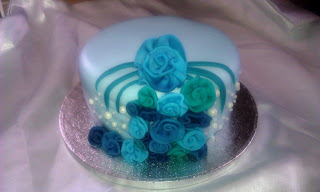 Here is a picture of a cake I did last week that was made with this recipe and a diary free vanilla buttercream filling. So that's it folks. I hope you enjoy the recipe:) Next post I will be sharing with you Neapolitan Rice Krispy Treats I came across on the web. They are soo cute and will work with any party you are planning. As you can see I did a lot of air brushing for this cake. I also made chocolate horse shoes that decorated the cake as well as fondant Black Eyed Susans.I had to include all 11 horses that were racing so those are the names scattered around the middle cake. The design is a lot plainer than what I normally do but she wanted to keep it simple for the first year and I am glad she did! The middle cake is a double stacked 12x18 airbrushed in brown. 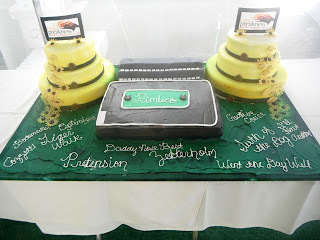 The 2 side cakes are 14, 10 and 8 inch rounds airbrushed in yellow. 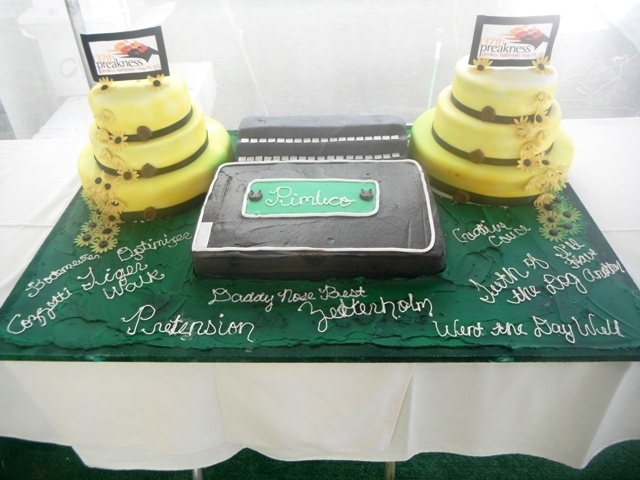 The signs on the top were made from fondant and had the Preakness 2012 logo on them. Each tier is wrapped in black ribbon. It always seems around here that I will have a quiet week and then mid week I'll get some phone calls and everything changes. This week was no exception, I started with no orders just 2 cakes I planned on doing for some co-workers of my hubby (one birthday and one had a baby a while ago). I have been so busy that I wanted to do something for them because they really support my husband at work and are really good friends to him, so this was going to be my thank you them. Well Wednesday comes and I start to plan out what I was going to do when I get not one but two cake orders, one for today (Friday) and one Sunday. So since I was already baking I just baked up the rest of the cake layers I needed. But since both of these are kind of detailed, the other 2 cakes have been put on the back burner until tomorrow so I can work on them. So needless to say those pictures will be in my post for Sunday. Today I wanted to discuss some older cakes I have done in the last two months. All three of them were made for birthdays for women ( I don't get many birthday cake orders for men.. men love cake too). All of them had some kind of feminine element to them whether it was bows, ruffles, buttons or flowers. I am starting to see that as a trend this years especially buttons and fabric looking flowers seem to be very popular. So the first cake was for a new client who wanted to order a cake for her grandmother. The only request she had was that it was a lime green color on the outside and the filling to be key lime. So I use a key lime curd filling and the covered the outside of the cake in lime green fondant. I could have just stopped there and put Happy Birthday on there but I always take these kinds of opportunities to do something different. So I use some button molds I recently purchased here via Etsy.com. I dusted them in pearl luster dust and glued them on in a diagonal pattern coming done the side of the cake. Once I did then I added a bow and dusted that in more pearl dust. It gave the cake the extra something it needed. My client was soo surprised and happy. The next two orders were done in the same week and were for some family members. The first was for my little sister in law who celebrated her 18th birthday and the second one was for my cousin in law. Since were visiting my in laws I brought both cakes along with me instead of shipping them like I normally do. My sister in law was very surprised because she had no idea I made her a cake ( I love surprising her:). I wanted to make her cake more sophisticated than the last cake I did for her 16th birthday. So I went with black and teal and a touch of bling. She loved it which of course makes me happy. I did a vanilla double barrel 5 inch cake on top and a regular 6 inch root beer cake on the bottom. I also added some white ruffle flowers for a pop. I love how I got the lid to sit at the angle.. which too me forever to figure out. LOL. And once I did I was like duh! So that's it for now until Sunday when I will showing you guys one very feminine Parisian graduation cake and bright baby shower cake.